So why did I skip out on prime chill time in Raleighwood to fly to California with my dog and hang out with my crazy family for 3 weeks? 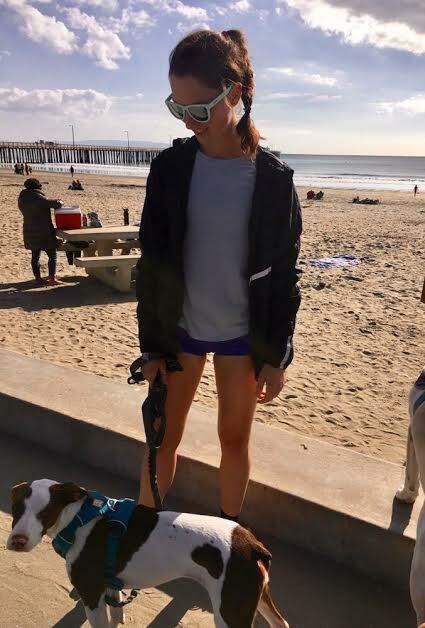 Well, aside from the fact that I missed California (it had been a whole year) and the snacks/sunrises/beaches/weather, coming home to reset and build fitness has been my winter break routine for as long as I’ve been an athlete. Lacrosse is a spring sport, so after a short season of fall ball our coaches sent a workout plan for us to get in shape before they kicked our butts at tryouts in January. Since I picked up lacrosse midway through high school, I never had great technique or finesse compared to my teammates. It was my speed and vision that made me competitive. I had to prove to the coaches each January that I belonged, so I worked hard at home in December. I was always motivated to push myself when nobody was watching because I knew why it was important. I was moved up to the travel roster as a sophomore to play at nationals where we earned 4th place. As a senior, I was one of the captains and got voted “most inspirational” by my teammates. My strength was flying around the field, sprinting back on defense to my spot at the top of the zone, and getting yellow cards for giving really good bruises. I always came to tryouts ready for the challenge, excited for permanently sore legs and the promises they held for the season ahead. My winter workouts look a little different now--bleachers are replaced by long run tempos and adding ~70 miles per week--but the idea is the same. My goal for this break has been to get away, put in work, eat snacks, and be ready to push my team to be better when January rolls around. I think I’ve done a pretty good job so far--I ran 300 miles, went to PT, visited In N Out and the old ice cream shop where I worked in high school, saw lots of cows, converted some vitamin D, and scaled some mountains. I’m back up to my fall mileage (low/mid 90s) and coffee consumption, so everything is right in the world. Time away has reminded me how lucky I am to have a team with resources like PT and gym memberships, (plus having company on long runs and workouts). I miss Raleigh, but I have a few more miles and meetings in Kansas City before I return to my teammates. When I get back, it’ll be crunch time before I know it. My 2019 plans look a little different than the rest of the team because of my school/career timeline. I have 6 months until I’m back to clinical rotations for my 4th (and final!) year of medical school. I really want to qualify for the Olympic Trials Marathon before then since I’ll have less time to put in miles and travel for races (especially once I start interviewing for residency in the fall). I’m trying to maximize my training time while my schedule is more open, and as of now, I have 9 minutes to cut from my marathon time. I’m looking at this spring like lacrosse season--the base has been built, and now it’s time to get game-ready. I’ll focus on a March marathon and I hope to recover quickly for some shorter races later in the spring. I have loved the grind of this building phase and I can’t wait to use my speed and endurance in 2019!